The reverberations that followed a drive in the countryside in April are only now settling. 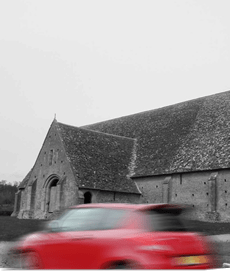 We had set our hearts on seeing a 13th century tithe barn, but there was a problem. It was four o’clock, the barn would close in an hour, and we were lost. We were driving along roads close to the monument but, with the local council’s provision of road signs being so miserly and with the details on our National Trust pamphlet so sketchy, our prospects of finding the barn in time were fading. Our difficulties were compounded by an overcast day that offered no way of navigating from the sun’s position, by a car-hire firm that hadn’t supplied a road map and by a satellite navigation device that would only direct us to an address on the Cardiff seafront! The Gods were conspiring against us. We stopped to ask for help and after drawing several blanks, finally fell upon a couple who had just been to the barn themselves. Directions given, they told us that the building was not to be missed and that getting there before the 5.00pm deadline would be difficult, adding that we would have to drive fast. Off we sped. The barn was still open and we visited it alone which made it particularly special. The building itself was vast – big enough to house two tennis courts placed end-to-end. And with its two giant doors, five-foot thick stone walls and high, wood-beamed roof, it was indeed marvellous. But there was a downside. Several weeks later I received a summons for speeding. Unbeknownst to me, our hurrying had been captured by a roadside camera, and as the driver I risked a fine and several penalty points. Unless, that is, I owned up and attended a Speed Awareness Course. If I did so, my points and fine would be waived. I opted for awareness. To break the ice we started with introductions. “Please speak with the person on your left.” My neighbour was a smiling, mid-thirties American solicitor who had been caught speeding while rushing home to feed her children. As we spoke she neither behaved nor looked like someone who would break the law but, by now, nor did anyone else. Then it was down to business, and with games, group work, interactive slides and videos, question-and-answer sessions and the occasional joke, the session sped by under Patrick’s skilful leadership. I left full of facts, ideas and questions. I relearned the obvious details about speed limits, road signs, the hazards to me and others of speeding and the legal implications of being caught for a second time! Amongst the new driving ideas there was a trick for spotting children; if a vehicle parked has large wheels it might be possible to see children playing by the kerbside by looking through under the chassis. And so on. In those gaps carefully left by all good speakers there was time to drift off and reflect more generally. It is said that it is in such moments that Nobel laureates have hatched key research. Although not exactly of the same order, in my case I found myself musing over my responsibilities as a road user, which encompassed duties both to myself and to others. Patrick can’t have known that in my less attentive moments my thoughts went along the lines: “Joe, over the years your reaction times have slowed, your attention span has shortened, you are now more easily distracted and even when wearing your driving glasses your peripheral vision is diminished, so should you continue to drive at all? Furthermore, Joe, when making your decision, how are you going to decide anyway?” Over the days since, after much deliberation plus a mixture of inertia and expediency, I have decided to continue driving. I confess that I have always erred on the speedy side in the past, but now I will be driving with a new-found timidity that is bound to infuriate others on the road. The irony of it all is that my affair with the speed camera, and all that has followed since, seems to have had a much greater influence on me than seeing the wonderful tithe barn. And I am now wondering whether to attend other driving courses, this time without needing the prompt of being caught behaving illegally. Any ideas Patrick? You were an inspiration. My father-in-law was in the same situation as you. He was never a fast driver to start with (surely, the speed camera was mistaken?) but after his speed awareness course he became even more cautious. He came to stay in the summer to cat/house sit whilst we were on holiday and wouldn’t hear of us taking a taxi to the airport, even at 5:45 am, and very kindly drove us there – at 28mph. Slowing down even further to go through every village en route, I swear we were overtaken by a milk float at one point, and several other drivers were provoked into quite dangerous manoeuvres to pass us. The whole experience was quite frazzling – and we just made the check in desk with 3 minutes to spare! Another fine tale Joe – although a pattern seems to emerging here. I think that you are just trying to cram too much into your working day. Only last week, you almost missed the last call at the Montparnasse Cemetery by arriving 10 mins before closing time. This week, we hear of your manic rush to fit in a five minute visit to a 13th Century Tithe Barn, with the consequences described. Rather than give up driving, might it not be better to take on fewer activities? I suggest that you set a ‘threshold’ of, say, 3:00 in the afternoon, after which time you undertake only relaxing activities. I personally refuse to take telephone calls or answer emails after this hour. In your case, may I respectfully suggest that, should you suddenly be possessed by a desire to visit a Cathedral, Art Gallery or similar monument, you instead repair to the nearest tea shop. Oolong is a particularly soothing brew, and its admirers (of whom I am one) say that it is both calming and has antioxidant properties that may help reduce harmful free radicals and arrest some of the effects of ageing. You’ll find more on Oolong here and free radicals, antioxidants and ageing here.